Judge Sergio Tapia, who is overseeing the case, set the third preliminary hearing for October 13 at 8:30 a.m.
Stansberry, 44, is a small business owner in Ottumwa, Iowa. He said Tierra and her boyfriend Joseph Proennke (Williams), 24, had just arrived in Los Angeles to meet with his biological mother Mary Ann Davis, 44. Proennke, Davis, her partner Jerry Clemons, 59, and one unidentified person also perished in the fire. The building where the fire took place is located at 2411 West 8th Street in Los Angeles. A transient said several of the homeless people who used to sleep in the now boarded-up complex have moved to a partially abandoned building next door. 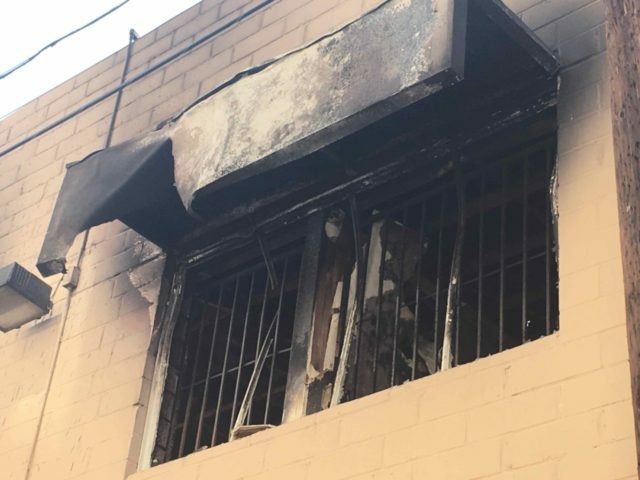 Breitbart News previously reported that Sanchez, who is originally from Honduras, had allegedly “started the fire to avenge a beating he took in a dispute over occupying a room” in the building, which is used by homeless people. Judge Sanchez said since this was a “special circumstance” case, Sanchez did not receive bail, which means he will be held behind bars until the next court date. “Sadly, the number of victims in this case is unusual but having special circumstance murders involving arson fires, unfortunately, is not unusual,” District Attorney Sean Carney, who is prosecuting Sanchez, told Breitbart News. Both Carney and Deputy District Attorney Joy Roberts said Sanchez is potentially facing the death penalty if he is found guilty by the court. Sanchez requested the media not take his pictures or videos during Tuesday’s hearing, a request that was granted by Judge Tapia. The most disturbing issue is that if our laws had been enforced, this wouldn’t have happened. He was in custody on June 8 for drug possession. And five days later, on June 13, he was released and committed this heinous act. So it’s a failure of our government, on many levels, and here we have the system protecting his identity. Where’s the protection for the five Americans permanently separated from their families by no fault of their own?